Mary Kay Neff's graphic design class participated in a service learning project for the Greensburg Community Development Corporation (GCDC). The goal of the project was to attract a business owner to rent or purchase a vacant building in the Greensburg business district. All students listed to the goals for the graphic design project, brainstormed ideas, and created designs that were presented to the Director of GCDC. After consideration and consultation with the current building owner, Shelby Kyllo's design was chosen to be installed in the vacant building. Success! Shelby's design work helped to attracted the attention of a business owner who will soon occupy the building. Shelby Kyllo's design work for the graphic design service learning project. Graphic design majors presented their design ideas to Steve Gifford and the owners of Oliver's Pourhouse in Greensburg. Students are working on window graphics to enrich the environment. Lots of helpful suggestions and ideas were shared during the discussions. The students are now working on brining their design concepts to life. Breanna Kelly with her design which was chosen for Oliver's Pourhouse restaurant. In my independent study course, MaRissa Boros designed banners for Greensburg, Pennsylvania that are hung in the city's shopping and cultural district. Marissa worked with me and Steven Gifford, Director of Greensburg Community Development Corporation, and designed a series of banners that display the nature of the districts they represent. Below are a few of the designs she created. Caritas Christi hosted Seton Arts Service Corps this summer. Fifty children from the Greensburg, Pennsylvania area were taught by the Seton Arts Scholars. 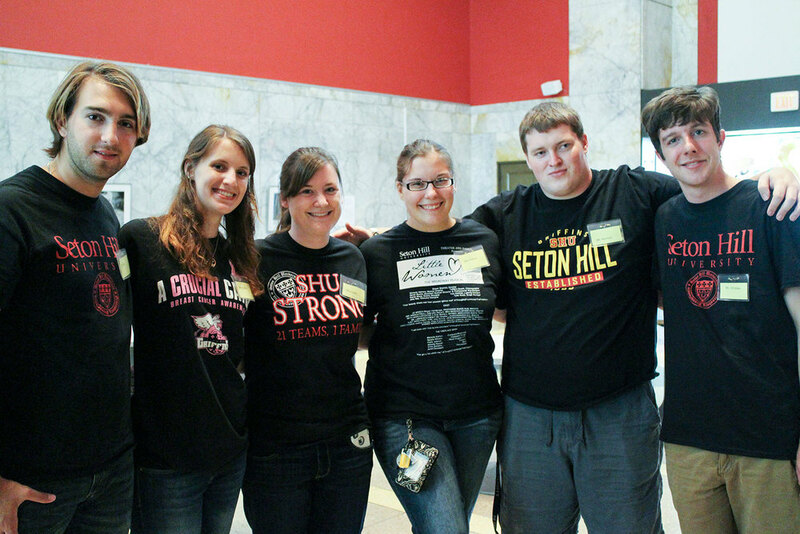 The six scholars are majoring in art, music and theatre at Seton Hill U Division of Visual and Performing Arts. Seton Arts Service Corps is a cooperative program between the Sisters of Charity and Seton Hill University to bring the power of the arts to children. "The Corps recruits Seton Hill University scholars who bring to the learners their love of the arts, their energy, and their commitment to reaching the next generation. The scholars, in turn, gain the benefit of practicing their profession and creating a real-time learning environment among the children. The collaborative interaction among children, scholars, mentors, and parents assures an intergenerational learning experience."